To reach Coroico travel along Death Road on a biking tour or take a bus on the new highway. 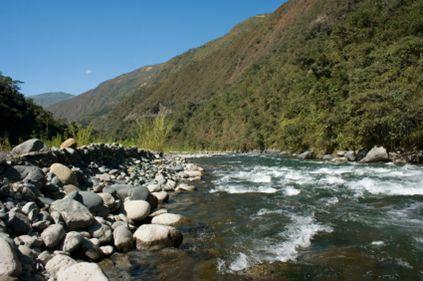 Use this as a checklist of things you need to know about the Coroico, the Golden Valley of the Andes. Use the links above and below for more information. 1. Coroico travel is now easier since the new, safer paved highway was built. You don’t have to take Death Road any more. Read to find information on buses and how to get to Coroico, Bolivia. 2. The Bolivia Road of Death lives up to its name. Between 100 and 300 people die in accidents on this road each year, including. Be sure you really want to do this and are in good health and top shape if you choose a Death Road biking tour. 3. Be sure you can withstand high altitudes. Located over 4000 meters above sea level between La Paz and its northern Yungas (jungle) region, you’ll drive to the Cumbre (the summit) of the Andes before you head downward to the rainforest regardless of whether you take the new road or the old road (death road). Read about altitude sickness here and what you can do to get relief. 3. Bottled water. You’ll find little roadside kiosks along the way but sodas are more abundant than water and only have mineral water. 4. Warm clothing. At the summit it is very cold all year. You have to reach the summit before you descend to Coroico. 13. Rain jacket You’ll be heading from the Andes into the rainforest. In addition, if it’s the rainy season you’ll want to cover up when your bus makes rest stops. There is also always the risk of landslides, even on the new road, which often leave vehicles stranded for hours. 16. Swimsuit Some biking tours end with a free lunch, shower and swim in a hotel pool, or if you plan on spending some days in Coroico there are several nice hotels with pools. It’s hot here! Once you pass the Cumbre you generally head downward toward the Yungas, or jungle region. However, this very peculiar rainforest is still over 1500 meters above sea level. The Yungas are warmish to extremely hot 9 months of the year and warm to coolish between June and August. Since the trip covers both crossing the Andes and going down into the rainforest, you have to dress in layers so you can peel them off as you enter the warmer region so you don’t freeze at the beginning or overheat when you arrive. I like to time my travel to arrive in Coroico very early in the morning when the views are unforgettable! However, the region is moist and fog is dense. I choose this because the view of the clouds hanging below you and the mountain tops sticking up out of them is absolutely unforgettable. Usually I take a car. Biking tours typically leave La Paz in the early morning and arrive in the early afternoon. 1. The electricity in Coroico is 220V. 2. There is only one small bank in Coroico called PRODEM. It does not have an ATM that takes international credit cards, but you can get a cash advance from your credit card at the bank if you need to. It also has a Western Union. 3. Larger hotels and restaurants may accept credit cards. Most smaller ones and some hostels don’t. Here's more on Bolivian money. 4. There is one ENTEL "call center" or kiosk where you can make local, national and international calls and can also place cellphone calls. There are also 2 internet cafés in town. I think Hotel Esmeralda is the only hotel in town with Internet. The connection is slow in Coroico. If you plan to bring a cellphone with you, be aware that Bolivia is on a different grid and many overseas cellphones don't work here. You may be better off renting a cellphone. Here's how to place phone calls in Bolivia. 5. In Bolivia you must carry your documentation at all times. 7. Never accept a foreign bill, such as dollars, that have even the tiniest tear. No one will accept them from you. 8. Although Coroico is small there is some crime. Never leave your bags unattended. Beware of pickpockets. Inasmuch as possible use local radio taxis (the ones you call to pick you up). Don’t share taxis with strangers. Don’t accept drinks from strangers. In an emergency, call the Police by dialing 110. 9. There are several laundry services and dry cleaners. If your hotel or hostel itself doesn't offer this service, they can tell you who does laundry by the kilogram in town. However, be aware that your laundry will be washed by hand and line-dried outdoors. If it’s rainy or cold it could take a long time to dry. 11. If you need health care, Coroico has one hospital and there are several pharmacies around the main plaza. 12. In an emergency dial the Police at 110. In a non-emergency situation call them at 525-1923.